Start faster. We’ve added a plethora of prebuilt intents to get you started. Prebuilt Intents that focus on customer care, industry and other common chatbot controls. Feel free to add these to your virtual assistant, modify them, or add your own utterances. These are yours to customize as you please. What do you do when a consumer interacting with your bot asks an unrelated question in the middle of a conversation? Using point and click, we’ve made it easy to allow your end users to change the topic and have the user return to where they left off. For example, imagine a user is in the middle of adding their spouse to their credit card and asks “Can also I add my 18-year-old to the card as well?” In this scenario, Digressions allows the question to be answered and return the user to where they left off in the “add a spouse” process. You can now quickly search for intents and entities, saving time when building your virtual assistant. So how do you manage all of your dialog nodes as you scale our your virtual assistant? With folders, you can easily group dialog nodes together keeping a clear dialog structure as you scale out your conversational application. Today, when setting context for a given dialog node, users need to go into our JSON editor. This is no longer an issue, as we have added a simple interface to set context directly in the UI. When building a virtual assistant, you often want to test it out in our Try it panel. What happens when you’re trying to troubleshoot a problem? We’ve added a feature that allows you to see exactly what dialog nodes were hit during a given utterance. It’s critical you understand how your virtual assistant is performing. We are committed to continually expanding our dashboard metrics and analytics to support your assistant. As part of this release, we are introducing some new metrics to better understand your users. This includes total messages, messages per conversation, total users and conversations per user. When improving a virtual assistant, you don’t want to impact the production instance while you are making changes. We now allow you to specify a log file to record all of your virtual assistant activity. This log file can be accessed by any Workspace to improve, while not impacting your current production Assistant. These new capabilities are just the beginning. Stay tuned as we add new features to Watson Assistant over the summer – if you want to get early access, sign up for our beta program. Follow the instructions below on how to signup. Please note, this is a waitlist so it may be a few weeks before you are granted access. Beta access is granted on an instance level, meaning you should NOT choose an instance that is in production. We suggest creating a new dev instance. a) If you already have an account and need to create a new instance, login to the IBM Cloud console. 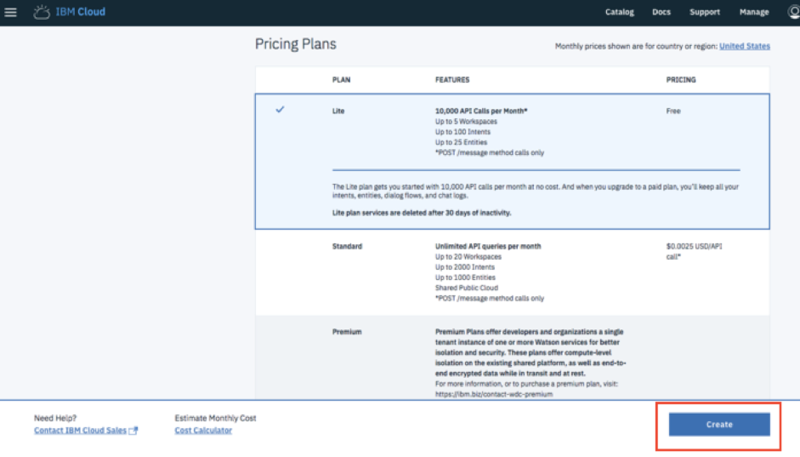 d) Give your service instance a name, select a pricing plan and click Create. e) Now when you access the tooling for Watson Assistant, you should be in the new service instance. If you’d like to change instances, click the Change link on your Workspaces page. f) From the workspaces page of your new service instance, select Request beta access. Watson Assistant will transform your business by increasing your customer satisfaction, empowering your live agents and lowering support costs. Try the solution to see first-hand how it will allow you to build a conversational solution that scales across your organization.